Mosquito control is the task of managing the population of mosquitoes to reduce their damage to human health, economies, and enjoyment of mosquito-ridden areas. Mosquito control is a vital public-health practice because mosquitoes spread many diseases such as malaria, dengue and chickengunya. Present Scenario of Mosquito Related Diseases. In 2013 inspite of various mosquito control programs and precautionary measure for mosquito control Mumbai had recorded 927 cases and 11 deaths. The previous year saw 1,008 cases, and five deaths. However, in 2014, Mumbai already has 696 confirmed cases of dengue, and 12 deaths. Bandra East West , Andheri, Malbar Hill, Walkeshwar, Mumbai Central, Tardeo , Prabhadevi, Dadar, Khar, Santacruz, Worli, Byculla & Ghatkopar wards has been identified as high risk areas. Thane, Nalasopara, Vasai & Palghar has reported 1302 dengue cases out of these cases 60% cases confirmed in Thane. Maharashtra has recorded 100072 malaria cases. Greater Mumbai tops with list of 2688 positive cases. Maximum number of cases after Mumbai are Thane (576), Kalyan (127), Navi Mumbai (63), Mira bhayander (49) & Virar Vasai (41). About 3000 species of mosquitoes have been described on a world-wide basis.Mosquitoes belong to a group of insects that requires blood to develop fertile eggs. Males do not lay eggs, thus, male mosquitoes do not bite. The females are the egg producers and "host-seek" for a blood meal. Anopheles- Mosquitoes lay eggs in fresh stagnant water. Responsible for Malaria disease. Culex - Mosquitoes lay eggs in polluted waters such as drains, ponds, stagnant streams, pool, tanks, barrels, tins, wells, sewage manholes, overhead tanks and other artificial containers. Aedes – Mosquitoes lay eggs in flower vase, single drop of water, storage tank, underground tank, ground cement tank, solid waste (drums), and earthen pots. Responsible for dengue disease. Residual spraying: In this treatment we spray a colorless and odorless insecticide on the walls. The insecticide is harmless for human beings. The mosquitoes sit on the wall, come in contact with the insecticide and die. This mosquito control treatment is effective for 15-30 days. This treatment can be done in both residential and commercial areas. Misting Treatment: A special machine called ULV Mist blower is used producing droplets/ mist in the range of 5-50 microns. The spray consists of heavy duty blower assembly, nozzle housing and formulation tank. It creates a ultra low volume spray droplets penetrate into cracks and crevices for controlling mosquitoes and other flying insects in their natural habitats. It is very effective against mosquitoes and covers more area in less spray solution. It leaves no visible traces. This mosquito control treatment is effective for 15-30 days. This treatment can be done in both residential and commercial areas. Mechanical Barriers: Mosquitoes can be kept out of the home by keeping windows, doors and porches tightly screened (16-18 mesh). 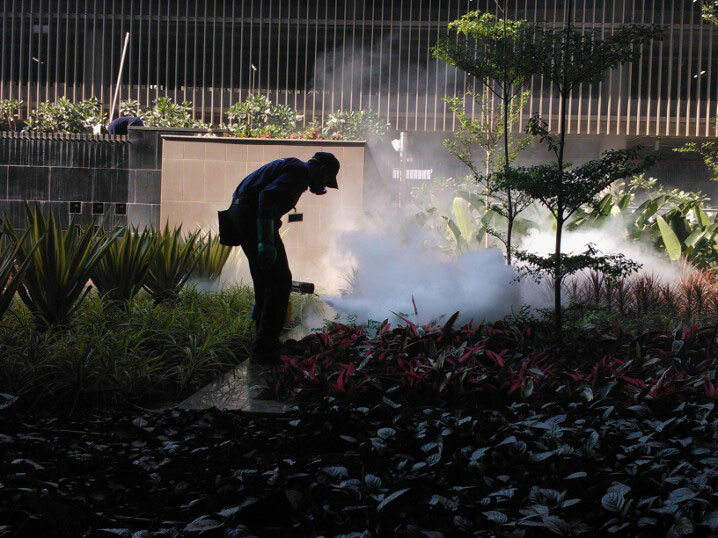 Thermal fogging: This is a process initiated to control air borne adult mosquitoes. Thermal fogging is the effective method to keep away the adult mosquitoes. Chemically infused aqueous liquid is dispensed in the air at low volume to create an invisible chemical cloud which targets flying or resting mosquitoes. Ideal time for fogging is during dusk and dawn hours. Larvae - Mosquito Control: An efficient way for mosquito control is to find and eliminate their larval habitat eliminating large larval development sites (source reduction) such as swamps or sluggishly moving streams or ditches may require community-wide effort. They might impound an area of water, establish ditches or canals or control the aquatic weeds on a body of water. Destroy or dispose of tin cans, old tires, buckets, unused plastic swimming pools or other containers that collect and hold water. Do not allow water to accumulate in the saucers of flowerpots, cemetery urns or in pet dishes for more than 2 days. Change the water in birdbaths and wading pools at least once a week and stock ornamental pools with top feeding predacious minnows. Eliminate standing water around animal watering troughs. Flush livestock water troughs twice a week. If ditches do not flow and contain stagnant water for one week or longer, they can produce large numbers of mosquitoes.